Amplifiers are highly linear MOSFET with GAIN 20dB; (operation in class A or AB) suitable for all kinds of digital and analog modulation. They have control the transmitted output power, over and reverse polarity voltage protection, measure indoor temperature (° C for all models), single DC supply 28V DC. Other frequencies and wattages upon request. 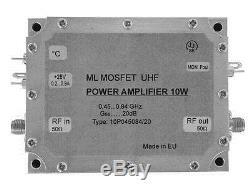 The item "UHF power amplifier, UHF TV power amplifier 10With20dB, 450-800MHz power amplifier" is in sale since Wednesday, March 08, 2017. This item is in the category "Consumer Electronics\Radio Communication\Ham, Amateur Radio\Ham Radio Amplifiers". The seller is "jan_jenca" and is located in Presov, default. This item can be shipped worldwide.